This pocket book contains all the inspiration a mother needs to feel the power of her position as a mother to inspire her children. The mother is the first teacher and the inspiration of a child. Indeed, the prayer of a mother for her child is special and powerful and that is evident in the love that is shown in the yoga class. Parents give to their children selflessly. They will become boats, airplanes, and landing pads (!) in this class, which can be fun, but is a far cry from the relaxation of a typical adult yoga class. They do it for the love of their children. So in honour of all mothers, and everyone who has a mother, I am recommending A Mother’s Wish this week. 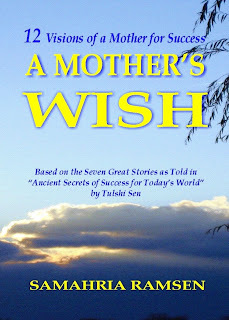 This book has 12 meditations for mothers to connect with their true power. It also has 7 stories that I teach from in my yoga classes. These stories can plant the seeds of greatness in children so that they may become the masters of their own lives. If you go to the author’s website there are also many wonderful resources for mothers, fathers, and all people – to feel that someone special in yourself. Visit Samahria Ramsen’s website by clicking here. and Happy Mother’s Day to all. Very Interesting combination of physical and mental application of Yoga.